I have spent quite a bit of time working on this picture over the course of the past few weeks. I was intending to post in progress photos as I went along but then things started to go awry and I decided to wait until the end to see how things turned out! At the bottom of this post, I wrote about my process. ©2014 Carolyn A Pappas, Leaves on Blue. 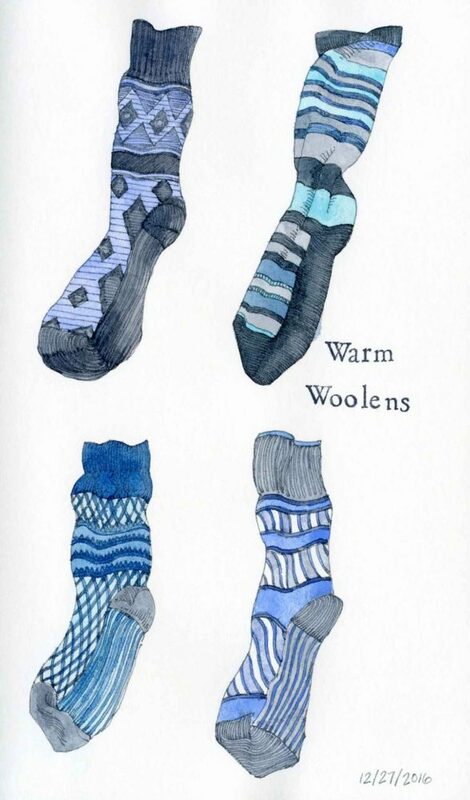 Ink and watercolor, 7.5 x 10.5 inches. 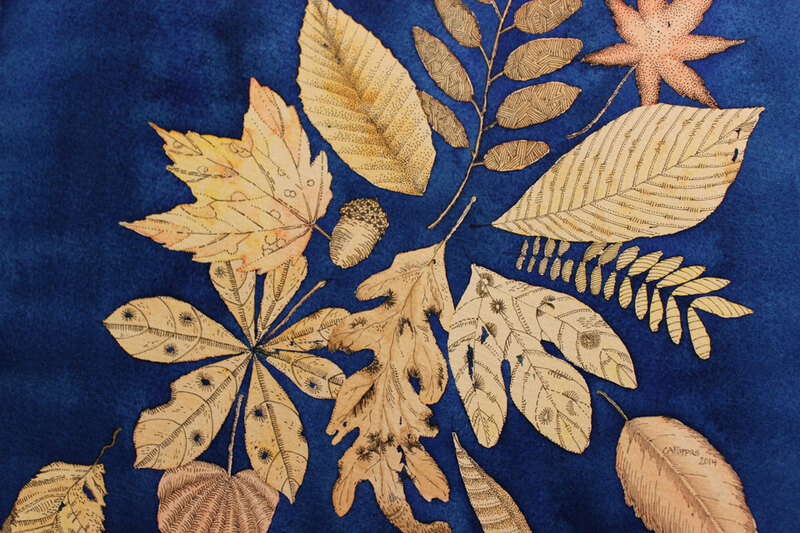 ©2014 Carolyn A Pappas, Leaves on Blue (WIP 4). Pen and ink, 7.5 x 10.5 inches. 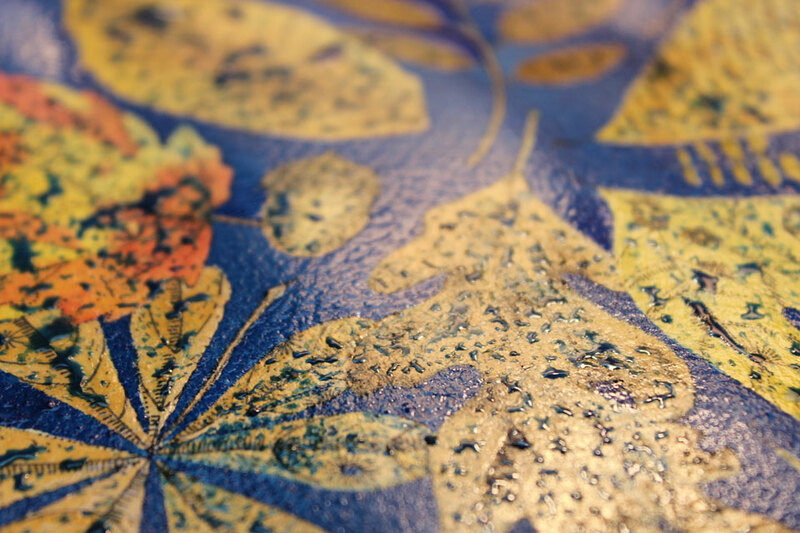 ©2014 Carolyn A Pappas, Leaves on Blue (WIP 3). Pen and ink, 7.5 x 10.5 inches. 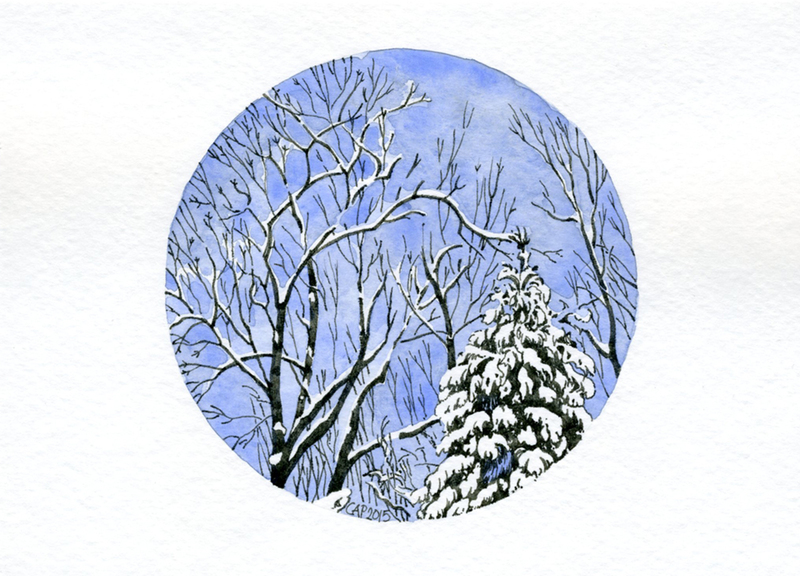 ©2014 Carolyn A Pappas, Leaves on Blue (WIP 2). Pen and ink, 7.5 x 10.5 inches. 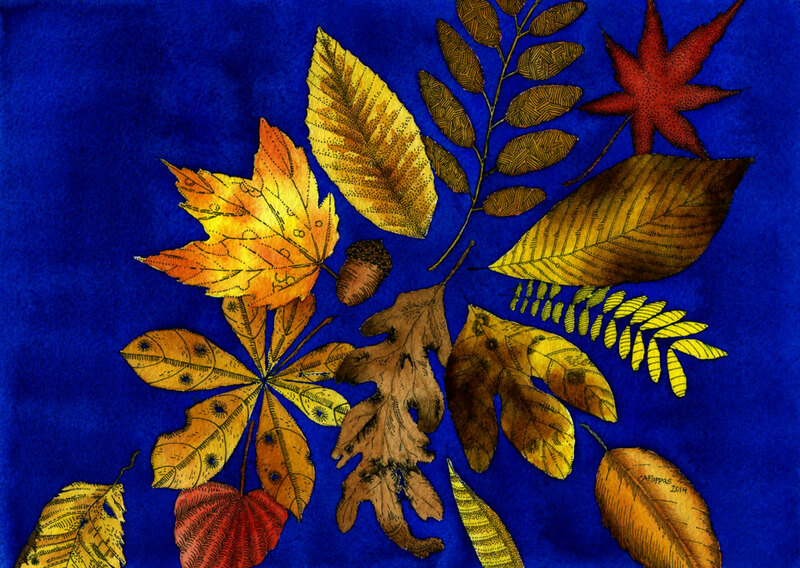 ©2014 Carolyn A Pappas, Leaves on Blue (WIP 1). Pen and ink, 7.5 x 10.5 inches. First I looked up general leaf shapes and sketched similar shapes on watercolor paper. I made up the pen and ink parts myself. I painted the leaves first, thinking that I could paint the background around them, but then realized that it wouldn’t work so I would have to use masking fluid. In retrospect, I should have just gone right in with the masking fluid from the beginning because when I removed it, the color was lifted. Additionally, I must have left some gaps because the blue seeped through in parts. 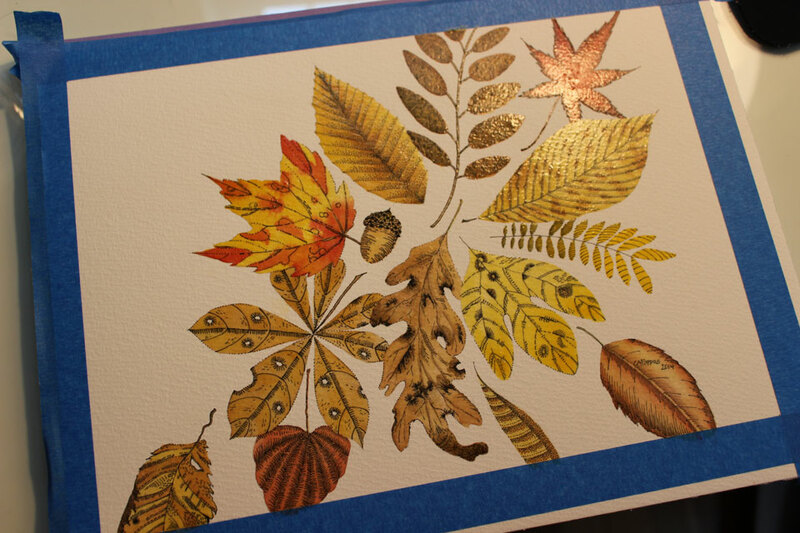 I had to repaint the leaves and also try to camouflage the blue. 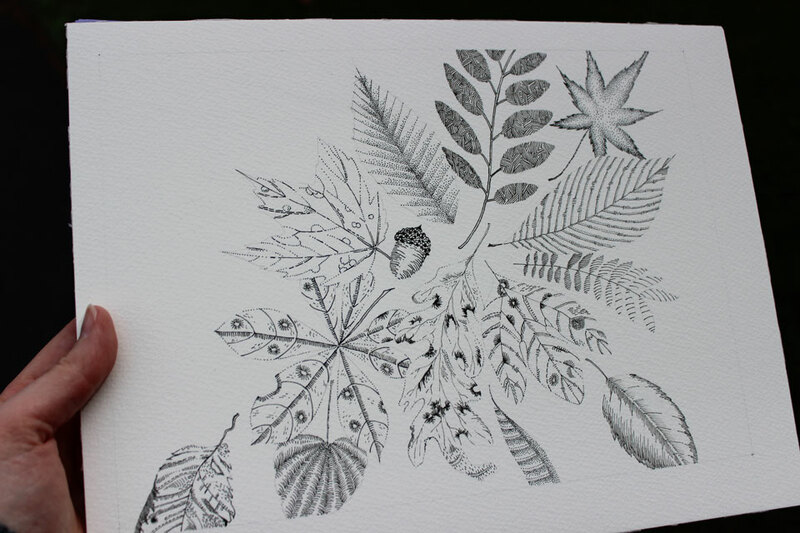 Luckily, I already had incorporated holes into the design of some of the leaves which made it easier in some places. Regardless of all the mishaps I like the finished painting. I have never painted such a dark and intense background before. Also, it was kind of refreshing to paint from my imagination without copying so directly from photos. This was also my first time using masking fluid for anything significant. It is definitely something I would be willing to try again. The background didn’t come out as dark as in reality in my scan and I tried to darken it, but now the browns are a bit darker than they are in the picture. In real life, it “pops” a lot more.